John Holmberg is a professor of physical resource theory and he also holds Sweden's first UNESCO chair in education for sustainable development. His background is in physics and in his doctoral dissertation he developed principles for a sustainable future, which received international dissemination through the Natural Step Foundation. His current research focuses on sustainability transitions and he is one of the founders of Chalmers Initiative for Innovation and Sustainability Transitions. He founded the world's first master's programme in Industrial Ecology and has also founded the Challenge Lab, which won the GUPES Green Gown Award in 2016. He has also devoted much time to more overall university development, for example, in the role of Vice President of Chalmers 2007-2016. 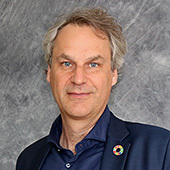 He has been active as an advisor and expert at the international level, for example, to the United Nations headquarters in New York in the preparation of Agenda 2030, with its 17 sustainable development goals; to UNESCO in Paris in the expert group for the decade of education for sustainable development; to UN-environment in Nairobi in its steering group for the Global University Partnership for Environment and Sustainable Development; to the EU in the Expert Group on Eco-efficiency; to the Swedish government in the Swedish Environmental Technology Council (Swentec) and in the Swedish delegation at the High Level Political Forum for Agenda 2030. He has also been an adviser to various management groups in business and the public sector in sustainability transitions and is frequently invited to give presentations in the field. He has received several awards, for example, for the best teacher in Sweden in the field of environment and sustainable development. Backcasting - What is a sustainable future and how do we reach it? Energy efficiency - a forgotten goal in the Swedish building sector? Materials for the Global Environment: Waste Mining in the 21st Century. Backcasting — a natural step when operationalising sustainable development. There might be more projects where John Holmberg participates, but you have to be logged in as a Chalmers employee to see them.